It’s happened again. I love to find inspiration for my jewelry pieces in fabrics and textiles. 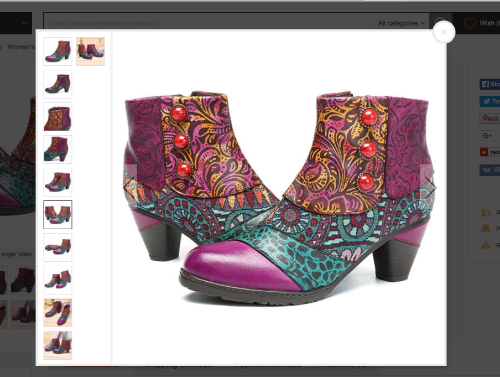 I stumbled upon these boots by SOCOFY on the internet and my mind immediately said POLYMER CLAY!!!! I could barely wait to get out my materials and try to mimic these colors, etc. and create some unique pendants. Begin by conditioning all clay. The amount of clay you use will depend upon the amount of finished pieces you wish to have. I used a whole package of the fuschia as it is my base color in addition to being an overlay color. Roll fuschia clay to about 1/8” thick. Place Peacock Feather silkscreen over the rolled clay and screen with black acrylic paint. Let dry thoroughly. Partially blend a small amount of fuschia clay with cadmium yellow clay to create a marbled effect. Roll out marbled clay to about 1/8” thick. Silkscreen with Leaf Cyclone and black acrylic paint. Let dry thoroughly. Roll turquoise clay to about 1/8” thick. 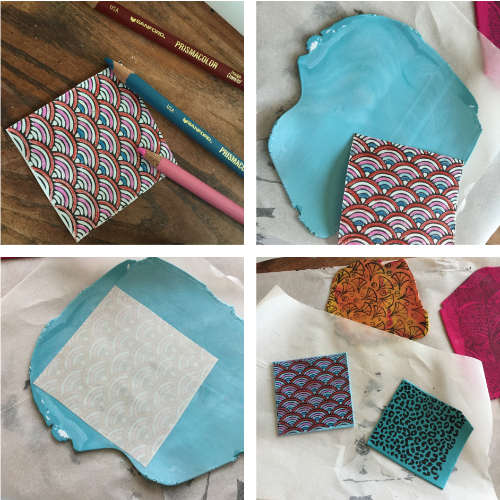 Cut out leopard print magic transfer paper square and place face down onto rolled clay. Burnish with finger. Allow to set about 15 minutes, then rinse under warm water and gently rub – the paper will disappear leaving the pattern on the clay! Blend a small amount of turqouise clay with white clay to create a lighter shade of turquoise. Roll to about 1/8” thick. Color “rainbow” pattern from Magic Transfer Paper with red, light pink, turqouise and lighter blue colored pencils. Place face down onto the light turquoise clay and gently burnish. Wait about 15 minutes, then rinse under warm water to remove backing. The color from the pencils will transfer with the printed image. Roll fuschia clay to about 3/8”. Use heart cutter to cut out a heart. Cut fuschia patterned heart in half lengthwise. Place half onto the solid heart base. 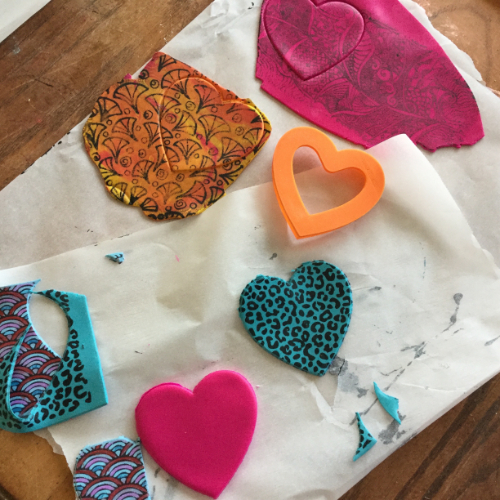 Use clay blade to cut sections from remaining 3 patterned clays and piece together on opposite side of heart. Extrude black clay with disc with multiple tiny holes. Gently twist two strands of extruded clay and place over all “seams” on the heart. Repeat around the outside edge. Use etch & pearl tool to create a hole large enough to pass two strands of satin cording through. Use scraps to create a patterned bead about 1/2” in diameter and make a large hole through it to hold 2 strands of satin cording. Roll out black clay to about 1/8”. 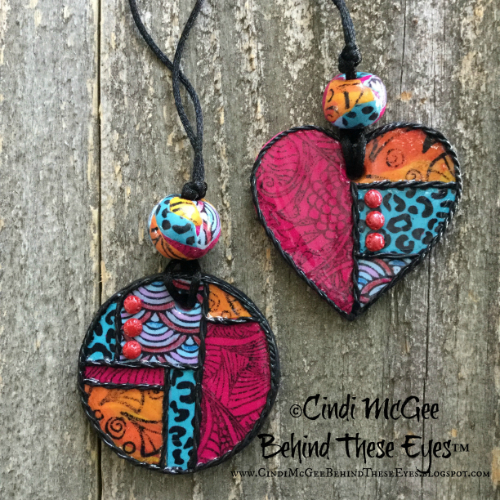 Cut thin strips the same thickness of the heart and wrap around the half of the heart with the multi-color sections (or go all the way around if you prefer!). Gently smooth to close seam. Bake again. 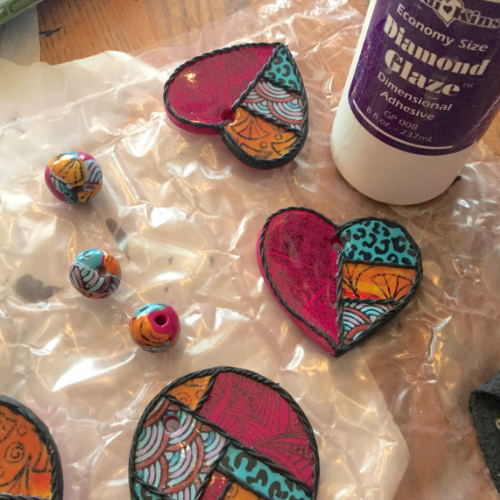 Apply Diamond Glaze over the surface of the patterned clays. Roll Sunset Pearl clay to about 1/8” thick. Use etch & pearl tool to create 3 small pearls for each pendant. Use tip of tool to add indentations around outer edge of each pearl. Lightly apply red mica powder to each. Bake. Let cool. Use Diamond Glaze to adhere to pendant. Add a light application of Diamond Glaze over each pearl. Let dry. Add satin cording with coordinating bead, and closure.